Your house is subjected to the elements constantly, including extreme types of weather like snow or strong winds. Because of this, various types of roof damage can occur as a result. However, there are ways you can spot them. 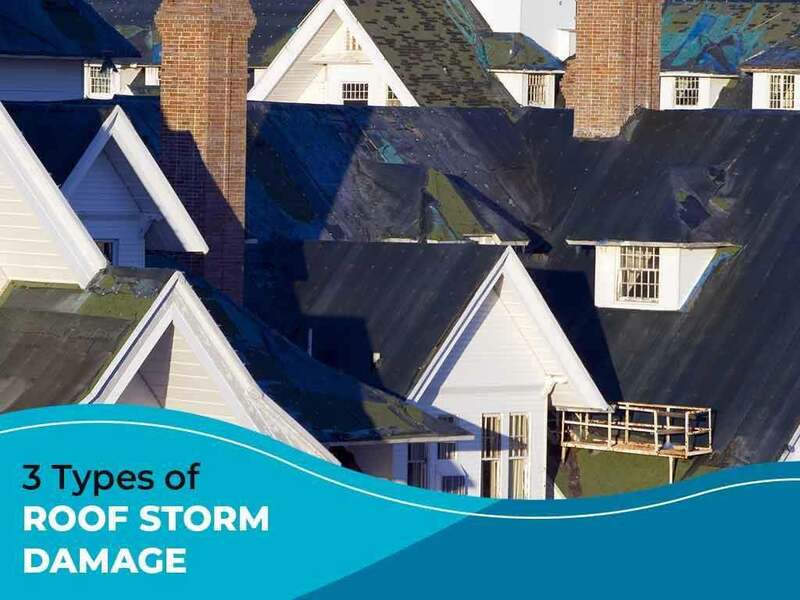 We’ve done plenty roof storm repairs over the years, and we’d like to help you learn more about the different kinds of damage from storms. Water damage is one of the most common due to its multiple sources. Whether it comes from heavy rainfall or from melted snowfall, water can eat through the structure of your roof and leak into the house, causing not just water damage, but property damage as well. Telltale signs of water damage are holes in the roof, dark stains on the wall or siding, and ice dams in the winter. Make sure you have flashing installed during your renovation roofing projects as this helps keep the moisture out of intersection points like chimneys or skylights. Damage due to high wind speeds will most likely be evident on your shingles. Shingles that are loose, pulled off partially or missing are the rather obvious signs of damage. Sometimes, you might find cracks throughout entire sections of your roof as though it had been ripped apart. Because of the damage that can arise from strong winds, certain warranties have coverage for wind speeds between 40 to 60 mph. Always ask your contractor about these should you need them. The last type of damage comes from hail. Though it is not as common as the other two, it can cause a lot of headaches for commercial roofing and residential roofing alike. Whether the hail is small or large, the impact on your shingles are often high-speed impacts. This can bore holes through your roof or crack your shingles. And once the hail pellets melt, you’re going to have to deal with water damage. This can be made worse by the fact that the hail had previously damaged your roof. As a roofing specialist, we have spent over 40 years taking care of homeowners who have to deal with storm damage. Our contractors know how to inspect the damage and will be happy to help you fill out your insurance transactions. Call us at (931) 208-2300 for more information on our services. We serve many areas, including Brentwood and Murfreesboro, TN.